Induction Brazing is the most reliable method of joining diamond to metals. It is also the most widely used and one of the areas where processes are held as trade secrets in most companies. This paper attempts to provide a general overview of brazing diamonds, and an overview of recently developed equipment used for the brazing of the components. Induction Brazing is a method of joining two pieces together using a third, molten filler metal – braze alloy. 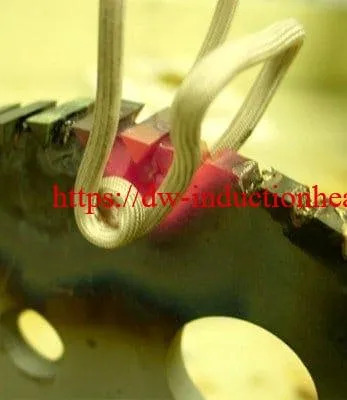 The joint area is heated above the melting point of the braze alloy but below the melting point of the materials being joined; the molten braze alloy flows into the gap between the other two materials by capillary action and forms a strong bond as it cools. Typically when joining metals, a diffusion bond is created between the two metals to be joined and the braze alloy. Of all the methods available for metal joining,induction brazing may be the most versatile. Brazed joints have great tensile strength – they are often stronger than the two metals being bonded together. Induction Brazed joints also repel gas and liquid, withstand vibration and shock and are unaffected by normal changes in temperature. Because the metals to be joined are not themselves melted, they are not warped or otherwise distorted and retain their original metallurgical characteristics. The process is well suited for joining dissimilar metals, which gives the assembly designer more material options. Complex assemblies can be manufactured in stages by using filler metals with progressively lower melting points. Additionally, a braze alloy may be chosen to compensate for the thermal expansion coefficient differences between two materials. Brazing is relatively fast and economical, requires relatively low temperatures and is highly adaptable to automation and lean manufacturing initiatives. Induction Brazing of diamond to metallic substrates differs significantly from brazing to join metals. Rather than relying on capillary action and a diffusion bond, the brazing of diamonds relies on a chemical reaction.